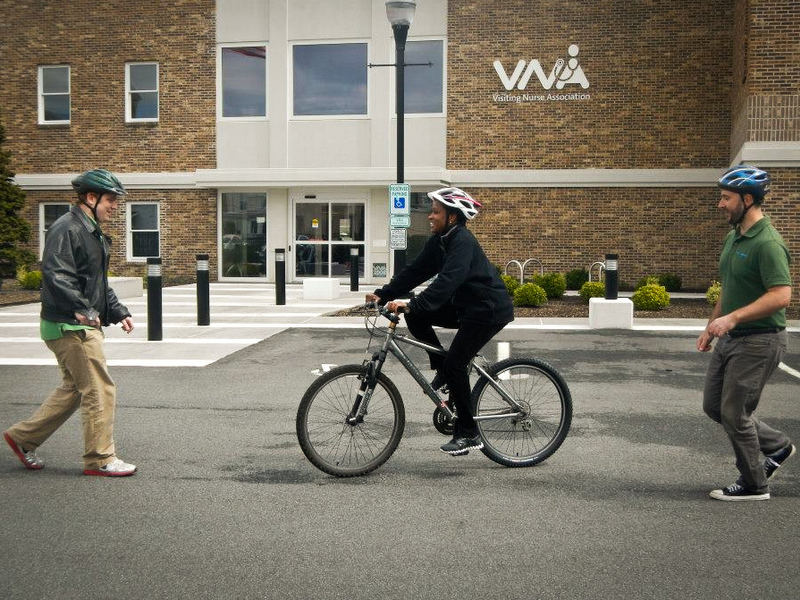 Bike Walk Town is happy to announce our 2014 Series of Bicycle Education Classes! This year, we are offering four Traffic Skills 101 clases and two Adult Learn to Ride classes. The spring classes kick off on April 12 and we will hold one traffic skills class a month through July. The Adult Learn to Ride Classes are being offered on May 10 and July 19. Check out the complete schedule and register online at our Eventbrite page. Bike & Walk Morristown feels pretty strongly that learning to ride safely in the road is a huge part of loving riding your bike around town. We have two local Morristown people, Tina Wahlstrom and Stephen Mirsky, who have become certified cycling instructors just to help Morristown people learn to be safe and confident while riding, and we also continue to team up with our friends at TransOptions, especially Bill Feeney, who has been a huge help in launching our adult learn to ride classes and is an expert teacher for Traffic Skills 101. Traffic Skills 101 is a full day class that combines classroom activities and on-road practice to teach you the principles of riding on the road and help you overcome any fears of riding in traffic. Students will learn how to navigate in traffic, repair flat tires, techniques to avoid a crash, and review New Jersey bike laws. For the Traffic Skills 101 class, you need to be 18 years old, know how to ride a bike and bring a safe and functional bike and a helmet with you. We offered Adult Learn to Ride classes last summer for the first time, and it honestly, this is my favorite event we offer. If you or someone you know has always regretted that they never learned to ride a bike, here is a chance to fix that in a short two-hour class. Students will how to balance, pedal, start, stop and steer, as well as adjust their helmet for proper fit. This class has the biggest smiles at the end I have ever seen. Thanks to TransOptions and Bill Feeney for helping make this class happen. Our classes are limited in size so that everyone can get all the attention they need to end these courses with all the info and skills they need, so sign up early! Also want to thank the Visiting Nurse Association of Northern New Jersey for letting us use their parking lot for all of these classes. Their generosity has helped so many students learn to ride and head on down the road to happier, healthier lives and their parking lot is the smoothest lot in town, for sure. Also many thanks to the town of Morristown for loaning us classroom space: we cannot thank the VNA and town enough for all their help in getting people safely riding.